Wednesday, 11. April 2012 Rhein Chemie will showcase its extensive portfolio for the rubber processing industry at EXPOBOR, Sao Paulo, the largest event for experts from the rubber industry in South America, from April 11-13, 2012. Sao Paulo, April 11, 2012 – Rhein Chemie will showcase its extensive portfolio for the rubber processing industry at EXPOBOR, Sao Paulo, the largest event for experts from the rubber industry in South America, from April 11-13, 2012. 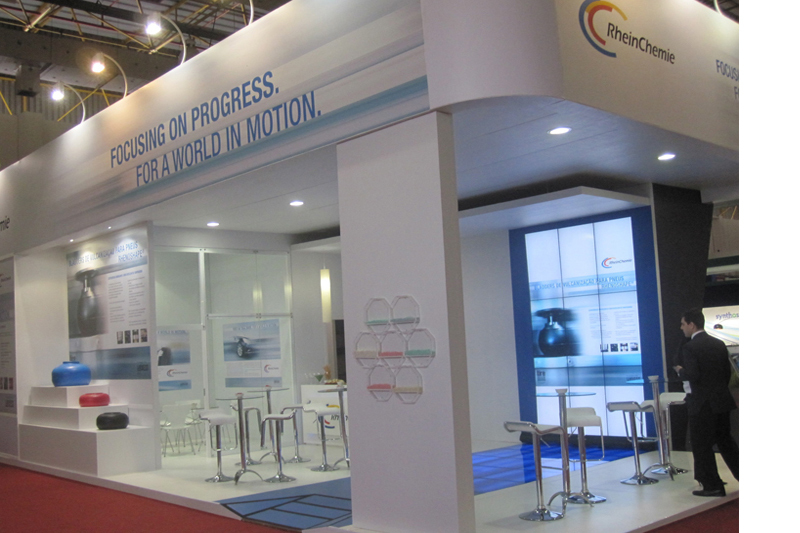 With its participation in EXPOBOR, Rhein Chemie, a wholly-owned subsidiary of the specialty chemicals company LANXESS, is underlining its commitment to Brazil and Latin America. With local production sites in Brazil, Argentina and Uruguay, Rhein Chemie has strongly committed itself to this important world region. “Rhein Chemie is currently building a new production site in Porto Feliz, Brazil, where Rhenoshape high-performance bladders will be produced from the end of 2012. And in 2013 we are also planning to set up new production facilities for Rhenogran pre-dispersed additives, thereby significantly expanding production capacity,” said Martin Assmuth, Regional Manager South America for Rhein Chemie at LANXESS Indústria de Produtos Químicos e Plásticos Ltda, Sao Paulo, Brazil. Rhein Chemie has strongly expanded its range of solutions for tire manufacturers since the beginning of last year. Eight weeks ago, Rhein Chemie was presented with the Tire Technology International Award for Innovation and Excellence and named Tire Industry Supplier of the Year. “Only last month, Rhein Chemie further augmented its bladder business by acquiring U.S. bladder manufacturer Tire Curing Bladders LLC (TCB),” said José Sganga, General Manager of Rhein Chemie Argentina S.A., Burzaco, Argentina, adding: “We shall further specifically expand our expertise in applications for tires to give our customers even more benefits.” At EXPOBOR, Rhein Chemie is focusing above all on Rhenoshape curing bladders, environmentally friendly Rhenodiv release agents, Rhenomark tire marking inks and Rhenogran predispersed additives. Rhein Chemie puts special emphasis on its green solutions in these product groups and is thus taking account of the growing significance of sustainability in the rubber industry. Rhenoshape tire curing bladders made by Rhein Chemie are pre-treated with a special bladder coating, allowing easy release of the bladder from the cured tire. In addition, the bladder surface is especially designed to prevent mold fouling. Both measures are resulting in a higher number of cycles and an extended working life. Major contributions to a responsible way of handling raw material resources and a safe working environment at the shop floor are also made by Rhein Chemie’s wide range of Rhenodiv tire release agents and Rhenomark tire marking inks. Both are strictly water-based and, hence, nonflammable and free of VOC: all these aspects are nowadays standard requirements of the industry. By using Rhenodiv SP semi-permanent inside tire paints from Rhein Chemie instead of standard inner lube, the consumption of release agents in this application can be reduced by more than 50 percent. All these product innovations are designed to enable a sustainable use of raw materials and natural resources and are cost-effective. Compounds used in high-performance tires are made to a growing extent with Rhenogran CLD-80, a modern sulfur donor enabling tires and technical rubber articles to withstand high dynamic loads and ambient temperatures resulting in an extended working life. Native raw materials also play a role of growing importance at Rhein Chemie. Rhenocure SDT/S, a modern sulfur donor for nitrosamine-free crosslinking, is now also offered in a “green” version in which one of the active ingredient molecule components is produced from renewable raw materials. Rhein Chemie supplies the rubber industry with a broad range of predispersed polymer-bound additives, processing promoters, vulcanization and filler activators, anti-sun check waxes, release agents, tire marking inks and high-performance bladders.